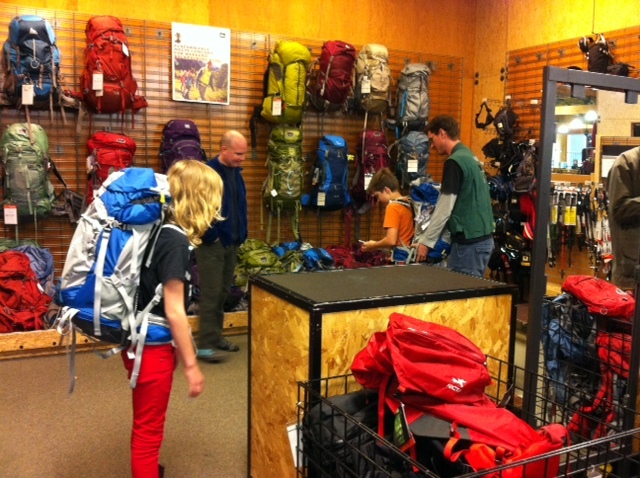 Here are the kids getting fitted in their packs. Julia has named hers Orville. Hmmm. Kid’s got an itch for popcorn. Sean chose not to name his because “boys don’t name things.” O-k-a-y. They think this is fun now because the packs are not filled with 30lbs as we trek in 90 degree heat through Northern Vietnam. The kids were given an option to pick patches to distinguish their packs. Julia picked a brittany spaniel Mickey-look-alike patch and a Valkyrie patch (a female warrior AND the name of her soccer team). Sean chose not to pick a patch because “boys don’t do that.” What a shame he wasn’t wearing his scouts shirt with a dozen or so patches on it when he told me that. I could have looked at him cross-eyed. Glad you and Kyle are finding out what “boys don’t do.” Golly, just think how much you’ve learned already and you haven’t even left the country. By the time you return your newly acquired knowledge will probably ooze from every orifice.